For those of you who missed the whole Gone Fishing World Premiere at the Rhode Island Film Festival on the blog, here is the whole edited Video Blog, one Webisode after another. I wanted to document the journey for other film makers who had not yet attended a major international film festival – so it’s the sights and sounds, as well and what I hoped would be the glam and the glitz. 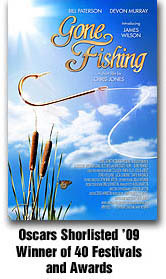 The screening of Gone Fishing in front of 2000 people... what did they think of it? The other stuff that goes on at film festivals and why all film makers love it! Gone Fishing screens on 35mm in front of a capacity audience on the closing night of the festival..! Webisode 6 - The Awards! It's getting VERY exciting now! I only saw the trailer for your short and I loved it. Congrats & best of luck at the Oscars! 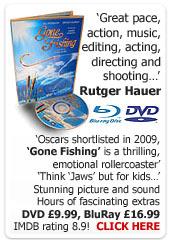 Congratulations for the award you won for Gone Fishing. Also, wish you good luck for the oscar nomination. Well done Chris. I went into living spirit just to have a quick squiz and watched all. Very interesting and a novel idea. Now I want to see 'Gone Fishing'. Best, Pete Matthews. Congratulations for winning the award for Gone Fishing. Best luck for the oscar nomination. I'm totally inspired by what you've done - I'm a British Actor who's moved into early pre-production stages ie. developing a feature script which I plan to shoot summer 09 - on a peanut budget - thanks so much for sharing your journey and for inspiring me to keep going!! Hi Chris, first I want to congratulate you! and second thanks for sharing this experience. I learned alot from this blog. I wish you the best for you future films to come. And before I forget, It was mentioned that the film would be screening in Miami in October, I live in Miami and would love to attend the screening. You were once a little upset with me Chris, when I suggested it was time Chris Jones author put down his pen to pick up a camera once again. Maybe now you can see why! Well done, Chris and well deserved. Take it all the way.